Abstract: New 3D silicon technology is very intriguing, and it if it works half as well as they say it will could offer up some substantial performance increases. We don't generally post press releases here, but this new 3D silicon technology is very intriguing, and it if it works half as well as they say it will could offer up some substantial performance increases to us. I wouldn't expect to see any memory based on 3D Silicon manufacturing till late in 2002 however. "The 3-D Technology Breakthrough Existing integrated circuits are built using active devices within a single layer of silicon. Additional layers above the substrate are used for wiring and structural strength. Matrix has developed and patented the technology to build 3-dimensional memory by stacking memory arrays vertically. Matrix 3-D Memory's array structure results in an archival storage device capable of storing data for more than 100 years. Matrix's memory is manufactured in a standard CMOS fab, using existing semiconductor materials and production equipment. 3-D Means Much Smaller Chips and Much Lower Cost By stacking memory elements vertically, Matrix uses a much smaller die area for a given density than traditional DRAM, SRAM, flash, and Mask ROM. By decreasing the chip size and increasing the yield, Matrix 3-D Memory can be produced at a fraction of the cost of existing technologies. Matrix 3-D Memory will scale at least as fast as other semiconductor technologies, maintaining its significant cost advantage with future process generations. By building semiconductor products in three dimensions, Matrix's technology makes the best use of a semiconductor wafer's area and achieves up to a tenfold cost reduction compared with existing technologies. By building "up" as well as "out," Matrix can dramatically increase the number of bits per silicon wafer and design chips for high-volume production at the absolute lowest cost. As importantly, Matrix can achieve these benefits using the standard materials, equipment, and processes already present and very well understood in the world's semiconductor manufacturing foundries. While others have attempted to produce a working three-dimensional chip, Matrix is the first to develop the methods to manufacture such products in high volumes, at low costs, and using standard materials and processes. Matrix and its technical team have been granted two U.S. patents covering the inventions around 3-D semiconductor design and production, and have filed over 60 additional applications. The first product based on Matrix's technology will be Matrix 3-D Memory, the first semiconductor memory developed for use as a "consumable," much like traditional camera film or audio tape. The initial markets for this first product will include archival storage for portable electronic devices such as digital cameras, digital audio players, portable games, PDAs, cell phones, and others. The technology also demonstrates great promise as a medium for pre-recorded content, such as music, electronic books, games, digital maps, and reference guides. Matrix 3-D Memory will be archival memory designed to store information securely for many decades. Memory cards based on Matrix 3-D Memory will be write-once, available in standard flash card form factors, and interchangeable with standard flash cards. Based on these characteristics and its low cost, Matrix will come to market under some of the world's most recognized brands in 2002. In addition to expanding Matrix 3-D Memory's applications, Matrix Semiconductor will continue to develop other semiconductor products based on 3-D technology. "Demonstrating that 3-D semiconductors are a reality today provides exciting promise to an industry ever innovating to meet market challenges," said Dr. Tom Lee, Stanford University Professor, Founder, and Director of Advanced Product Development at Matrix Semiconductor. "Matrix 3-D Memory will be a first, very important step in commercializing 3-D semiconductor technology. Breakthroughs of this magnitude do not happen often, and we are extremely excited about the markets for this product and the future applications of this technology." Founded in 1998, Matrix Semiconductor has developed the means to create three-dimensional semiconductors using standard manufacturing techniques and materials. 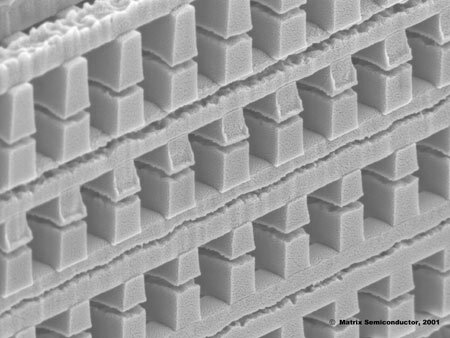 By optimizing use of a semiconductor wafer's area -- building "up" rather than "out" -- Matrix's 3-D technology produces ultra-dense chips for high-volume markets at dramatically lower costs than comparable technologies. Matrix's first product based on the technology, Matrix 3-D Memory (3DM) will combine the compact size, ruggedness, and low system cost of solid-state electronics with the cost-per-megabyte of disk technologies."